Last week I visited another arboretum here in southeastern Pennsylvania. The lush gardens are tucked away in a heavily populated area, but once inside the gates, the hustle bustle of the urban area is easily forgotten. 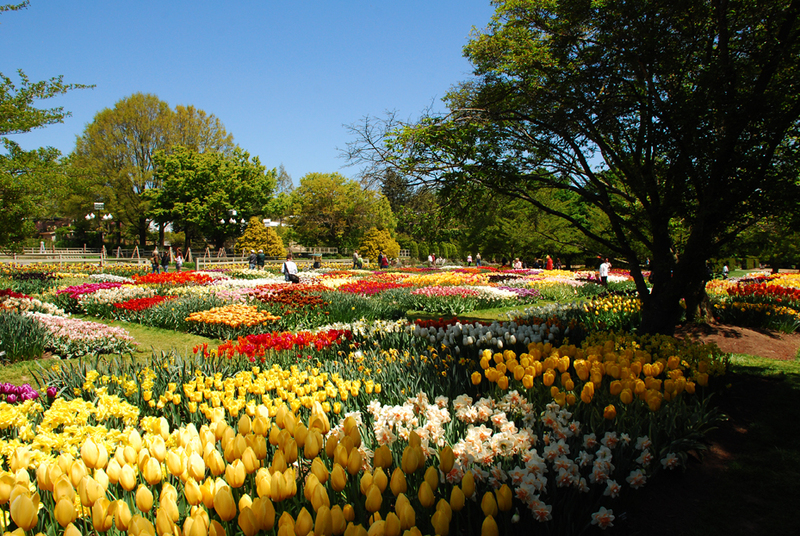 The botanical gardens consist of roughly 20 acres of native trees, shrubs, flowers, and ferns. Along with the native plants, there are also rhododendrons and azaleas from around the world, planted in gardens under the old growth trees. The abundance of shade provided by the trees, maintain optimum conditions for the understory plants do exceptionally well. Bog gardens flank the banks of a pond, and native wildflower gardens are planted in full sun. 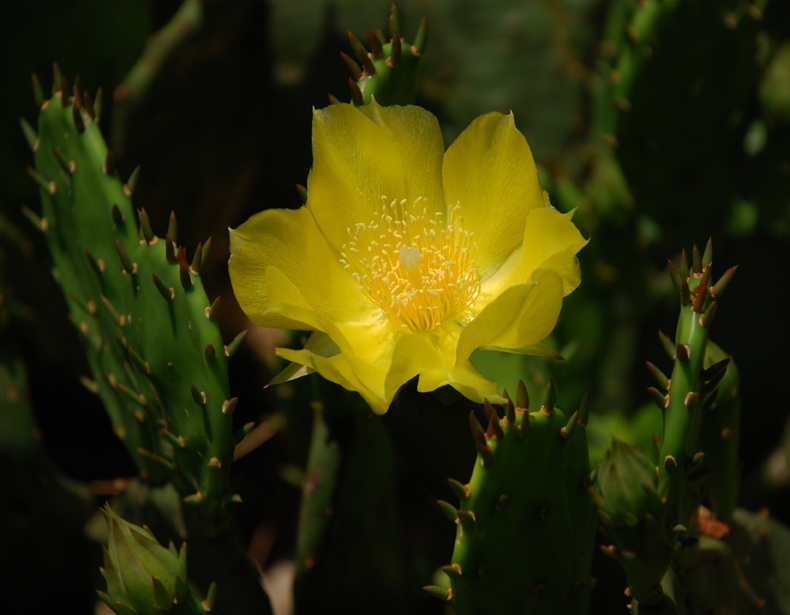 I took this photo of a prickly pear cactus, Opuntia humifusa, which was situated in dappled shade from a nearby honey locust tree. It was quite warm in the sun that day, so I made my way back to the paved pathways that meander through the woods. The deep shade was a welcome relief from the early summer heat. 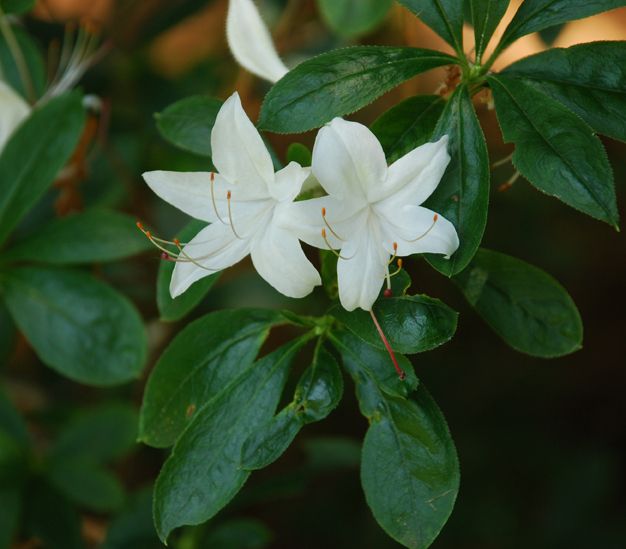 And that’s when I came across this swamp azalea, Rhododendron viscosum ‘oblongifolium’. The blooming season was finished for the azaleas, but this one shrub was persevering to give one last show before the hot summer temperatures are in full swing. 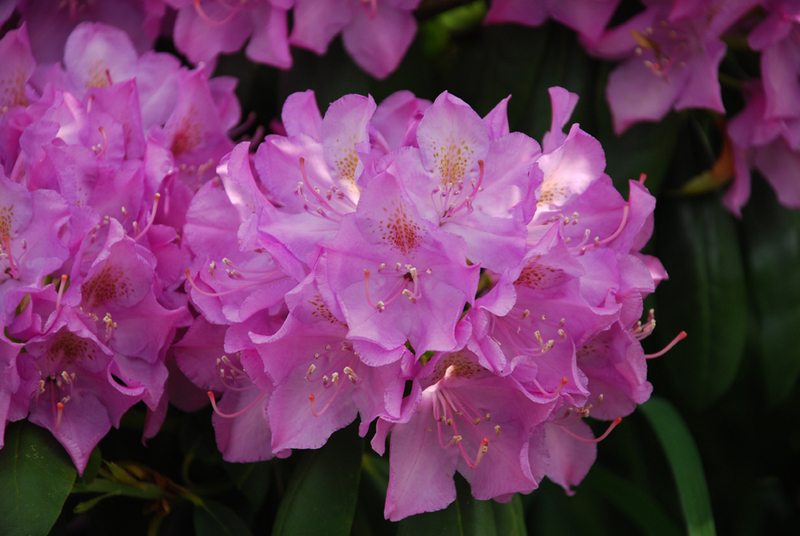 Some of my favorite flowering spring shrubs are the rhododendrons. I love to see the splash of color brightening the shady parts of a landscape. The blooms were long lasting this year since spring was actually… spring-like. Except for a few warm days, the temperatures have been much cooler compared to the last several seasons. I took this photo several weeks ago before the blooms faded till next season. For me, night photography in the digital age is really enjoyable due in part to the instant feedback available. For instance, when I’m photographing headlight and taillight trails, I can instantly see whether the exposure is where I want it, and if the composition is working. In the days of film, experimentation, experience, and a good bit of luck, played a major role in creating successful light trail photos. I took this photo a few weeks ago around 8:30 pm. and it was actually quite dark outside. 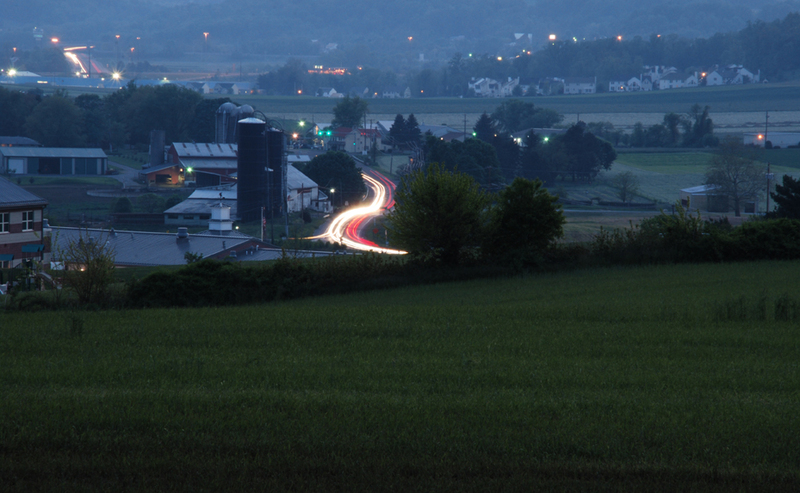 I was hoping to create an image resembling an evening at dusk with headlight and tail light trails. Not having a benchmark where to start, I experimented with many different shutter speeds ranging from five seconds up to 25 seconds. As the shutter speeds got progressively longer, the camera’s sensor gathered more light, and each photo resulted in a lighter scene with light trails. Shutter speeds below 10 seconds still produced the light trails, but the scene looked like it was late at night…completely black except for the points of light and the trails. Shutter speeds beyond the 10 second setting were getting closer to the look I was after. And on this particular evening, the 20 second mark produced the best results. Any more than 25 seconds and the photo was over-exposed. Digital sensors can be pushed pretty far before the heat generated by the sensor produces digital noise in the image. After taking long exposures of 20 seconds or more, it’s best to let the sensor cool for a minute or two before taking the next shot. And of course, a tripod or other sturdy support should be used to keep the camera steady during such long exposures. Also, a cable release or the camera’s self timer will assist in avoiding movement from tripping the shutter. Have fun and experiment…the results can be quite rewarding. This is one of the doors on the side of an old train station that last saw commuter rail service in 1981. The station is now occupied by a catering company and the building is often used for wedding receptions. 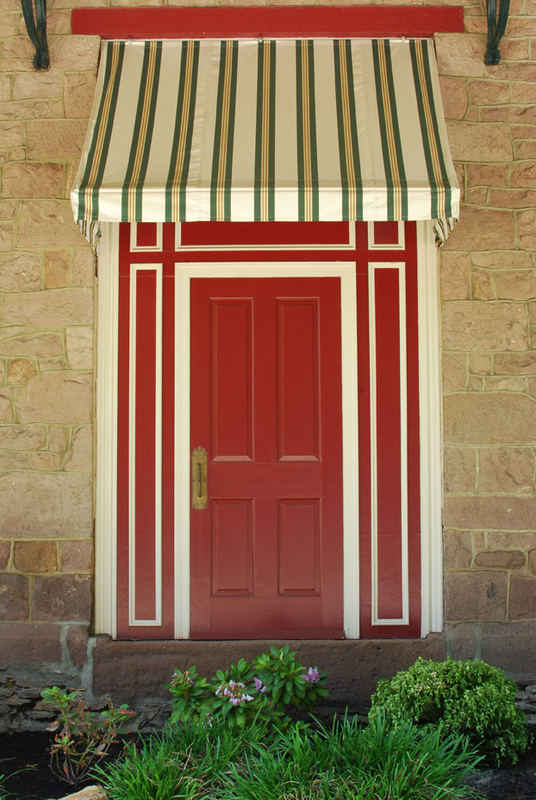 What attracted me to this scene were the colors used in the door and the striped awning contrasting with the stone wall. IN THE FIELD: What Is It? The majority of my photographic adventures take place in the great outdoors…where I come across scenic vistas, small towns, wildlife, flowers, and natural wonders. Recently, I was photographing early 20th century architecture in a nearby small town. I went inside the local library that was built in 1902. I had a feeling I would find some great shots of the moldings, windows and structural details that were used during that time period. I did discover carvings, ornate columns, a huge fireplace with an extravagant mantle, and many other details inside the library. But…there were quite a few folks studying and doing research. It was a little awkward trying to get some shots and not disturb anyone, so I decided to come back another day when it wasn’t so busy. As I was walking down the steps to the foyer, something told me to stop and look up. And that’s when I saw this hanging entrance light. 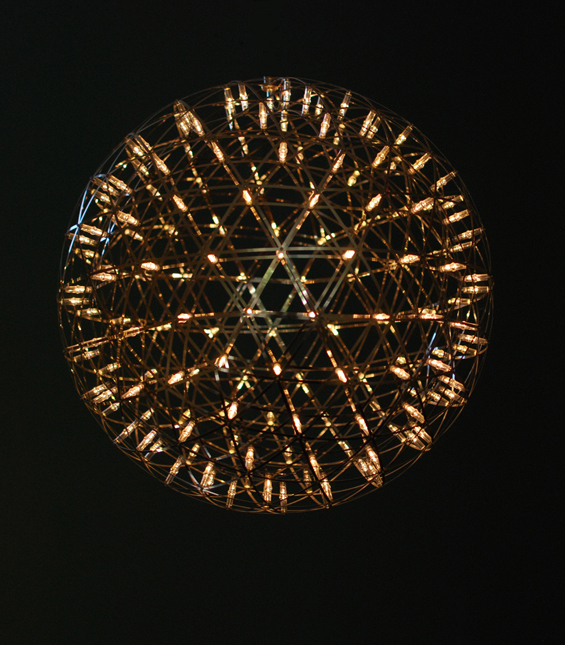 It’s made of metal bands and tiny light bulbs. 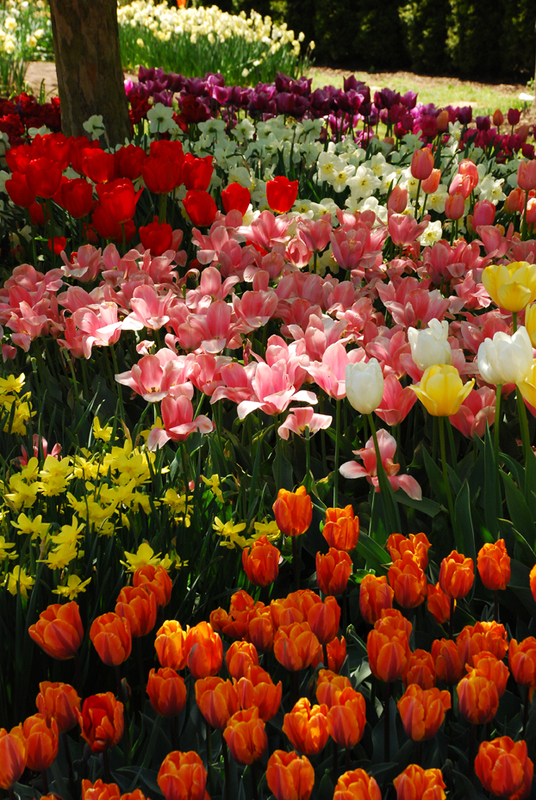 For many years we had a small area in our garden we wanted to devote to spring bulbs. Problem was, we couldn’t decide which variety to plant. We would pour over catalogs hoping they would provide some influence. Taking so long to decide had it’s consequences…we never got any bulbs planted. So we would wait until the next planting season and go through the same scenario again. This went on for several years. Finally we decided to just plant them all. Just kidding. 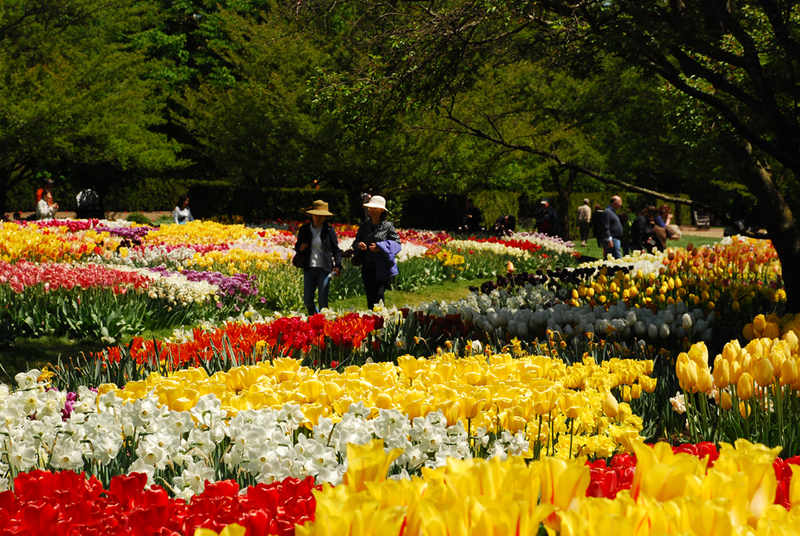 This is just a very very small portion of the 100,000 spring bulbs that were blooming at Longwood Gardens this spring. In fact, this view is probably only 1% of what was in flower. Here is a view of the area called The Idea Garden. Here is an even larger view of The Idea Garden. When these photos were taken, it was already noon time and the sun was directly overhead resulting in very harsh light. I was delayed getting to this area because I spent the morning in the Garden Walk. At that time the sun was lower in the sky. I have now come to the conclusion I need a clone. That way I could have photographed both areas under favorable lighting conditions. 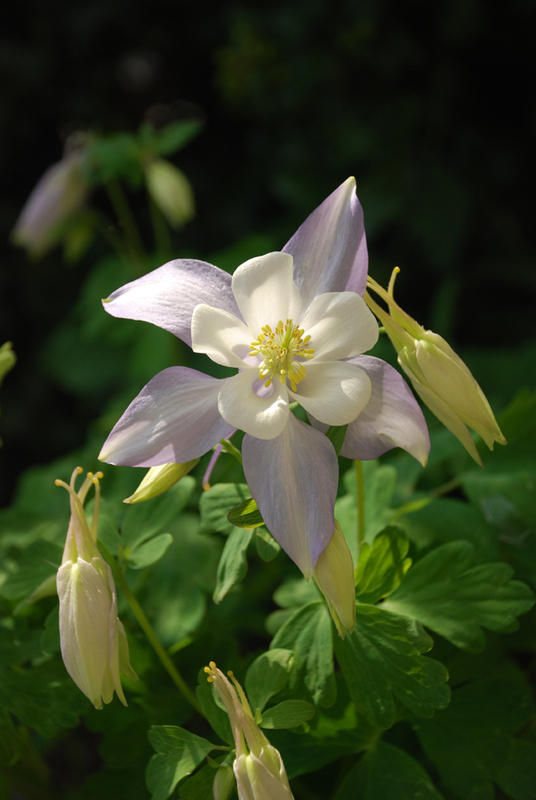 A few days ago we discovered this little columbine plant growing in a very odd place. It took up residence behind a bush next to the garage. We checked on it every morning to see how it was growing and wondered if and when it would bloom. One night last week while we were sleeping, the plant sent up stems and came into flower. The following morning we walked past the garage as we left to go on a puppy walk and were greeted with a wonderful surprise. There it was…as pretty as could be.